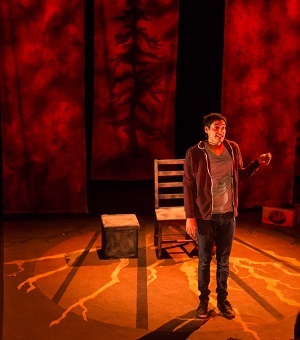 Native Earth Performing Arts kicks-off their 2015/16 season with a remount of award-winning Cree playwright, Cliff Cardinal’s darkly-comedic production, Huff, about First Nations youths dealing with solvent abuse in the face of familial tragedy. Previously opened to rave reviews at the 2012 SummerWorks Festival, the production was awarded the 2012 Buddies in Bad Times Vanguard Award for Risk & Innovation. We asked playwright and performer Cliff Cardinal and director Karin Randoja some questions about the production. Jon Kaplan from NOW Magazine wrote that this was your “only culturally specific work” so far, what inspired you to tell this story? Cliff Cardinal: I wrote a short story called “Huff” in, I think, 2005. First Nations kids who abuse solvents and who are at high risk of suicide is a scary subculture and I thought that as an artist I had a responsibility to empathize with that experience as much as I could. Substance abuse in our indigenous communities, while being a complex issue of major concern to health organizations and community leaders, is also sometimes used as a negative stereotype. What was your approach to this issue for HUFF? Karin Randoja: It’s a real issue. But I think for most people it is an issue of the intellect. We don’t really absorb the information and statistics on an emotional, energized level. In Huff, we try to show what chaos life can be in some families and communities. Chaos breeds more chaos. When you connect to and care for the characters in the play, and see bad things happen to them, and then see them reaching for their substance of choice … well, hopefully that is going to hit you on a more visceral level than a statistic and remain somewhere inside you. Honestly, I might take a lot of substances too if I were faced with some of the challenges we present in Huff. Karin Randoja: First, I would love them to have been happy to have come out and seen theatre. The Huff team has worked hard to make the show as artful, funny, creative and moving as is humanly possible! And secondly, I would love for audiences to be moved, truly moved by seeing a piece of theatre. To see and acknowledge some of the devastating issues that real people are facing right now, at this moment, in this country, as fellow Canadians … to see all this and to be moved by the humanity and pain in front of them. Conscious, visceral awareness is the first step to change. Always. From Joseph Recinos’s “call-out” in NOW Magazine for more onstage diversity to Sophia Fabiilli’s #FringeFemmeTO initiative in support of female playwrights at this summer’s Toronto Fringe Festival, there has been a lot of focus recently on the need for more diverse voices in Toronto theatre. What are your thoughts on representation in Toronto theatres? What can audiences or theatre creators do to support diversity on stage? Karin Randoja: I try not to think in terms of looks or colour, etc. when I am working on a project. I try to think in human terms, What is this human being on stage going through and experiencing? But if I am working on a piece and there is a character from another culture, I can’t imagine not casting from that culture. Because culture affects our bodies, our voices, our habits, our outlook. As far as supporting more diversity, that’s a challenging question. Because I don’t think art starts from a prescriptive or politically correct place. It starts from an inner drive to create something from deep inside oneself and there sure aren’t rules and regulations inside the human psyche! How do we “legislate” or make rules and standards for any art form? I don’t really have an effective answer to that question. Huff is playing until October 25th at the Aki Studio Theatre in the Daniels Spectrum (585 Dundas Street East). Shows run Tuesday to Saturday at 8 PM and Sunday at 2 PM. This show is approximately 70 minutes long with no intermission. Ticket are $15 – $30 and are available online or by telephone at 416-531-1402 (credit card only). Tickets are also available for purchase in person (cash, debit, or credit) one hour before each show begins at the Aki Studio Box Office. Pay-What-You-Can pricing is available for Tuesday performances. This show contains explicit content. Mature audiences only. Photo of Cliff Cardinal by Akipari.